All transactions are safe and secure with a reliable history in online purchasing behind each of our associates. Buy the Juno Macaroni t-shirt to own Juno clothing and merchandise. Is there a cheese to your macaroni? The Junoism on the front of this Ellen Page Juno t-shirt was derived from the Juno MacGuff quote, "As far as boyfriends go, Paulie Bleeker is totally boss. He is the cheese to my macaroni." After all, what would your macaroni be without its cheese? It would be a mere noodle in this lonely world. 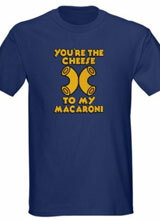 Wear one of these Juno movie tees to let everyone know that there is a cheese to your macaroni. The front of the tee displays the quote and noodles. Purchase this Juno movie tee with a maroon Dancing Elk Condors t-shirt that features the high school logo. In addition to the Juno Macaroni tee above, browse the Juno Clothing Gallery for more apparel like men's and women's clothes, kids shirts or hoodies.